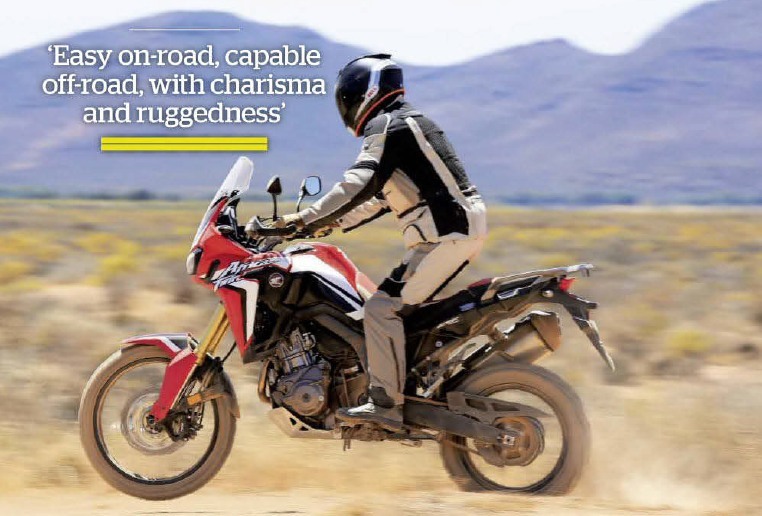 Real Riders: New Honda CRF1000L Africa Twin Review : Easy on-road, Capable off-road ! Since the old XRV750 Africa Twin was discontinued rugged big trail bikes have turned into luxurious adventure bikes. The new CRF1000L Honda Africa Twin model is a return to traditional values, but with 2016 technology. The sky is blue, the temperature gauge on the new CRF1000L Honda Africa Twin is nudging towards 40°C, the vents of my Dainese jacket are fully open and we’ve been warned to watch out for tortoises. That’s a new riding hazard for me. Ahead is a narrow track up to the Dead Ostrich Lookout (honestly, I didn’t make this up). In half a mile the trail climbs only a few hundred feet, has half a dozen turns and a couple of potential jumps, but it’s covered in loose rocks. We’re in South Africa for the launch of Honda’s much anticipated and all-new 1000cc adventure bike. The marketing spiel, backed up by the bike’s spec sheet, suggests the new Honda CRF1000L Africa Twin has proper off-road capability. The tyre sizes are dirt compatible 90/90-21 inch front and 150/70 R18 inch rear, there is nine inches of front suspension travel and eight at the rear and the narrow waisted, wide barred riding position works whether you are sitting down or standing up. There are two versions of the new Honda CRF1000L Africa Twin, with and without the latest version of Honda’s clever dual clutch automatic transmission (DCT). An automatic? Off-road? A discipline that requires a synaptic link from brain to back wheel, perfect gear selection and throttle control if you’re trying to find grip. Surely that’s never going to work? The track up to Dead Ostrich Lookout should provide a good test. And, just to be awkward, I’m going to make this harder. 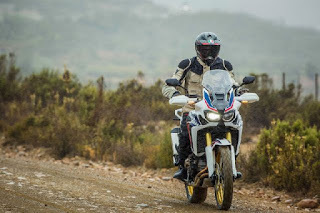 Increased speed makes the ride easier, and on the hard packed trails the new Honda CRF1000L Africa Twin is soon kicking up a trail of dust and feeling composed and reassuring at a giddy, for a trail like this, 60mph. The suspension is compliant and can soak up the terrain changes. Stay loose, steer with your feet and open the throttle in sand. It all comes together and within moments you forget that, if it goes wrong, you’ll have to pick up 230kg of motorcycle. Leaving the TC on level one (the lowest setting short of turning it off) means you can treat the throttle with a cavalier level of cack-handedness. Twist the new Honda CRF1000L Africa Twin into a corner, then nail it on exit. Feel the back end step out – feels like feet but is probably inches – and wait for the TC to slow the engine and find some grip before calamity occurs. It really increases confidence. The ECU detects, through a combination of throttle position, speed, engine rpm and gear position, whether the bike is going up or down hill, and alters instructions to the DCT and TC. But it’s still helpful to make a manual shift in some circumstances; like when you’re going too fast downhill on a loose surface so you don’t want to touch the brakes but do want to slow with the engine. Or when you launch yourself off a jump, but in the wrong direction and want to change orientation on landing. So just tap it down a gear with the thumb paddle and then get back on the gas at which point gear selection choice will revert to the DCT. The power delivery of the parallel twin with its 270˚ crank is smooth, with peak power of 94bhp at the 7500 rpm redline and 72 lb.ft of torque at 6000 rpm. Fuelling is perfect all the way from the 1500 rpm idle. In standard form the new Honda CRF1000L Africa Twin comes equipped with Dunlop Trailmax tyres (with inner tubes) but for this off-road section of the launch test the tyres that are kicking up the dust are Continental TKC knobblies. That’s fair enough. 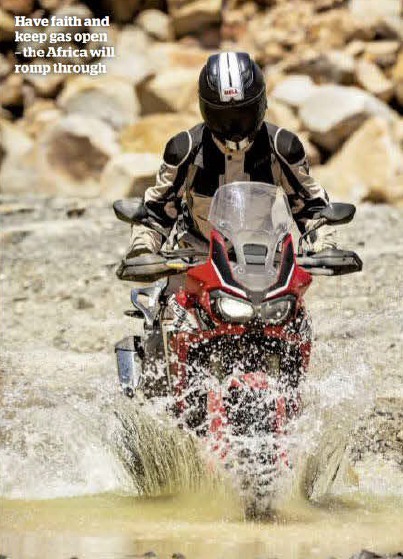 The new Honda CRF1000L Africa Twin encourages, comforts, reassures. Suspension is good. Compliant but nicely damped. Front brakes are single finger sensitive and rear ABS intervention allows heavy footed use of the rear brake. When we get another go at the Dead romps up effortlessly. I’m sure I managed to get it airborne too. Just. 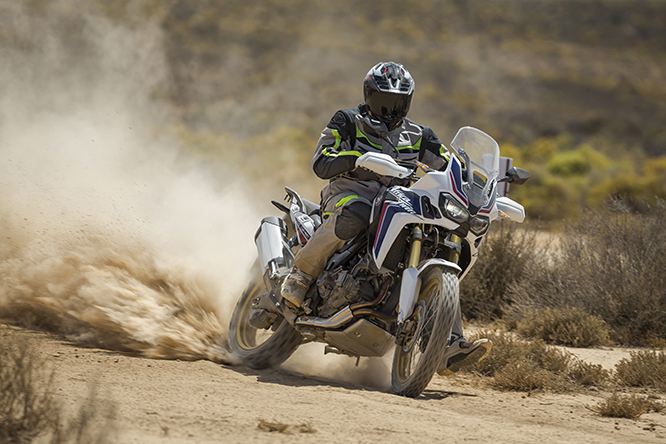 A 1000cc adventure bike shouldn’t be this easy to ride off-road. I’m sorry when they take the DCT bike off me and ask me to ride the normal one. I mean, clutch levers? They’re so last century. Seriously though, the conventional bike is good in these conditions too, just not as surprising or as encouraging as the DCT machine, and I don’t think I ride it as well. Of course, despite the off-road capability most Africa Twins will do most miles on tarmac. So we ride out onto a two-lane road running straight down a broad, empty valley, through the scrubby vegetation of the Western Cape – it’s called Fynbos. The screen is unobtrusively scaled and unadjustable, but really effective and the bike remains stable and calm past 100mph. The riding position is spacious. The seat has two positions (you can also get low and tall options). At 5’10”, I can’t quite get both feet flat on the floor, but six footers have no problem and the bike is so nicely balanced that using toes isn’t a big problem. I’m a front-of-seat sitter, but there’s room to push back and stretch out, and pillion space looks roomy too. This should be an all-day-long riding position. Tank capacity is a claimed 18.8 litres, or just over four gallons, giving 200 miles. Honda say DCT bikes are marginally more fuel efficient. There are decent mirrors, easy controls, a simple dash (albeit hard to read easily in bright sunlight) and LED running lights will make the new Honda CRF1000L Africa Twin a practical proposition on the Marylebone Road as well as the Pan-American Highway. Chassis is a steel cradle and six-point engine mountings keep everything rigid. Forks are 43mm, the swingarm a one-piece alloy casting. Suspension is fully adjustable, with the rear preload adjuster a fuss-free knob, rather than sophisticated electronics. 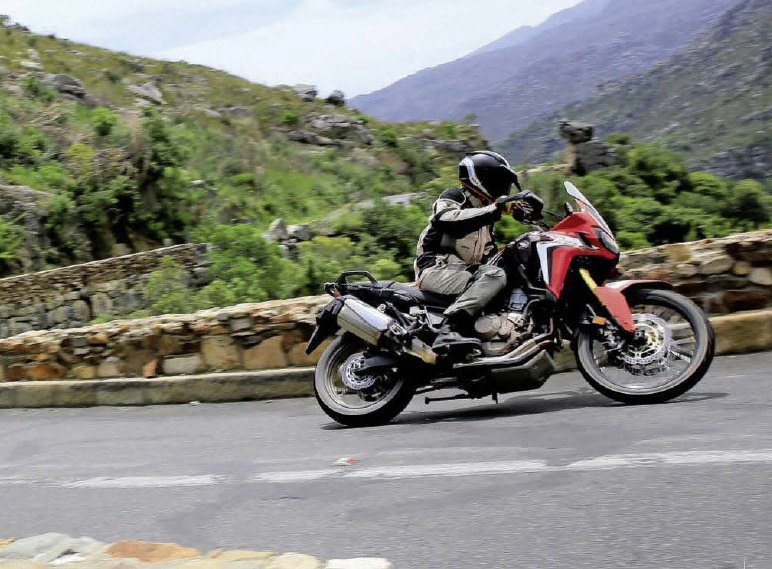 On the road the new Honda CRF1000L Africa Twin spins up smoothly, and while you’re aware of gentle vibes and the off-beat firing sequence it’s not really a character trait in the way it is on a Yamaha MT-07. Power delivery is linear. With ‘only’ 94bhp the new Honda CRF1000L Africa Twin is producing the same amount of power as a Triumph Tiger 800, and marginally more than the BMWF800GS. Compared to bigger adventure bikes, like the BMW R1200GS or KTM1190, it obviously lacks grunt throughout the rev range. With a pillion and luggage you’d really notice it. And, while we're doing comparisons with a wet weight of 232 kg for the base bike, and another ten for the DCT, it’s not significantly lighter than other bikes in this class. 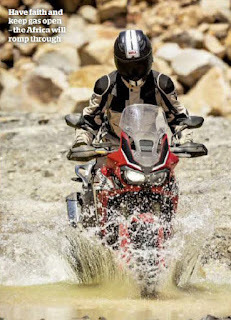 The basic GS is a claimed 238kg wet, the Tiger 800 is around 210. But the Honda hides its weight well on the move. Switching from straight and smooth highways to tighter, twisting tarmac shows the new Honda CRF1000L Africa Twin to be nicely balanced and neutral. With all that suspension travel there’s some pitch under acceleration or on the brakes, but it doesn’t upset the bike. This would be accentuated with a pillion though, and the smooth shifts of the DCT version would counter that. I’m really keen to do a long two-up trip on this bike. It’s fun on challenging roads, especially with poor surfaces. The wide bars allow you to tip the bike in, though when it was really wriggly I adopt a dirt bike style of pushing the bike down into turns. Faster tarmac fun, at the silly end of the scale, shows up the compromises that are a result of the bike’s off-road capability. Narrow Dunlop Trailmax tyres, a 21-inch front and weight transfer from long travel softish suspension mean it’s not as confidence inspiring as a tauter, faster-turning bike with smaller wheels and grippier tyres (though in fairness this isn’t helped by rippled, non-stick road surfaces). For me this only manifests itself as a lack of confidence on turn-in. But the more exuberant riders note a lack of grip in extremis, and increase pace also exposes a drawback of DCT. I want the reassurance of plenty of engine braking entering a turn, and even in sport with intervention up to three, it still doesn't change down early enough, though of course it’s easy enough to employ the thumb paddle. Riding the same road, but in opposite directions, on the DCT and conventional bike, I’m faster and more comfy on the normal bike. But I’m not familiar enough with DCT. It’d take more than a day and a half to break 40 years of gear-change habits. Later, I realise that I’m overthinking this. At a normal pace the DCT gives a good, mellow, view-admiring ride, perfect for an adventure bike. And when you are riding aggressively there’s no hardship in using your thumb to change down early. I was cynical about Honda reviving the Africa Twin name after 13-years, especially when new parallel twin shares nothing tangible with the old V-twin. But after riding the bike, it makes sense. This is a big trail bike in the old manner, where off-road ability creates a bike that is easy and usable on road, but which can go off-road and has the charisma to go with that capability. DCT or manual is personal preference, but I’d go DCT. Partly because I’m intrigued to spend more time with it, and partly because helmet bashing will be an issue with this plush suspension and a pillion. DCT should make for a more harmonious ride. 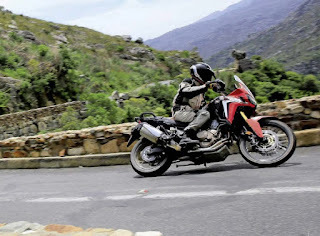 The new Honda CRF1000L Africa Twin in South Africa at 40° centigrade was great, but I can’t wait to ride one in North Yorkshire. Better than a GS? Yes, if you want to leave tarmac. No 1000cc bike should be this cosseting off-road. But if you need the BMW’s extra 30bhp the Africa Twin probably isn’t for you. DCT option? Yes. The New Honda CRF1000L Africa Twin should be in dealers in February.